The Valley Dale Ballroom began as a stagecoach stop in the 1880s and later served as a tavern and overnight inn. 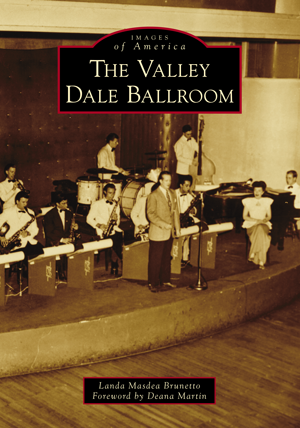 The dance hall was added in the early 1920s, thus bringing about the birth of the Valley Dale Ballroom, or "The Dale." In the 1930s, the wisdom of the Peppe brothers' ballroom purchase and their connection to the neoteric music of that generation assisted in their cultivation of the big band era. Significant musical giants like Benny Goodman, Harry James, Glenn Miller, Duke Ellington, and Dean Martin (before he knew Tommy Dorsey's vocalist Frank Sinatra) each appeared on that marvelous stage, while CBS and MBS broadcast nightly from the ballroom. After World War II ended, the ballroom was no longer the nightly spot for music it once was. War and soaring band costs ushered in different uses for the ballroom's survival; it was hosting rock bands while becoming a wedding and event facility. Interior designer Landa Masdea Brunetto’s Valley Dale passion ignited with the narrative of her parents’ first date at the ballroom. Her musician father schooled her on big band history. Masdea Brunetto’s love of this historic building deepened as her father helped to create the 1970s resurgence of big bands to the Valley Dale Ballroom. The majority of photographs in this book are graciously shared from the Peppe family archives, with additional contributions from the Columbus Dispatch, local bands, and Valley Dale fans.